Air Source Heat Pumps are an efficient source of renewable heat. They work by extracting heat from the outside air, and can do so down to temperatures as low as -15°C, although they are less efficient at very low temperatures. If correctly specified, they can provide enough heat to meet all the heating and domestic hot water requirements for the property. 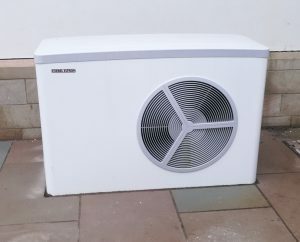 They are usually positioned against a suitable exterior wall and require very little space, although they do need air to circulate freely around them. They usually consist of an outdoor unit, with a fan to draw air over a large heat exchanger, and an indoor unit housing the hot water cylinder and controls. To find out more about air source heat pumps please see FAQs. 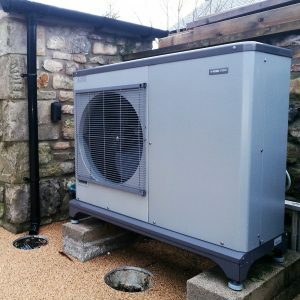 If you would like to discuss how an air source heat pump could benefit your project please contact Fervo Renewable Energy on 0333 240 2121 or make an enquiry.